Employees are the heart of Columbus State. The efforts of our faculty and staff shape the lives of students, ensure the vitality of the college and strengthen our community. As a member of the Columbus State family, you understand the many challenges faced by our students. By making a meaningful investment as an employee donor, you can take your work to another level and make a transformative difference in the life of a deserving student. 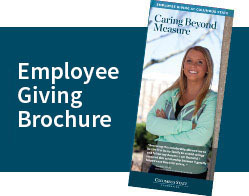 Participating in the Employee Giving Campaign is easy and impactful. You can make a one time gift by clicking the "give now" button or set up your payroll deduction contribution through the link on the right of this page. Click here to hear our keynote speaker Teresa Lister, from our 2017 Employee Giving Breakfast. Click here to see pictures from our most recent Employee Giving Breakfast! Click here to see a list of scholarship funds you can designate your gift to. Note: Undesignated gifts are put towards the area of greatest need. I believe in what we do. I believe in the students that we serve, I value having the opportunity to help transform lives through education. I have often heard that you can tell what a person truly values by looking at where they spend their money! I am honored to 'spend my money', to give to scholarships that indeed, provide students opportunities to change their lives. As a Columbus Technical Institute/Columbus State Community College alumna, I owe it to the school and to the Foundation sponsors to give back all the privileges they have afforded me over the years from being a student and all through my years of service to the college. CS has given me the opportunity to pursue my higher education degrees and my long successful career in international education. One of the things I love most about working at Columbus State is the fact that I get to spend my days with colleagues that are 100% committed to each of our students as individuals. CSCC staff and faculty demonstrate their dedication to students every day in words and actions. Giving to the Foundation is one more way to live that pledge.